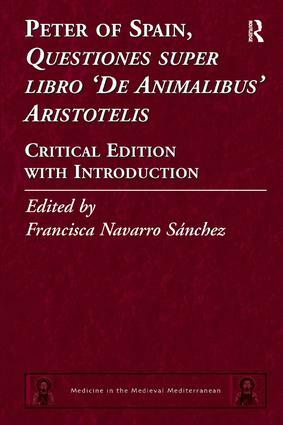 This book presents an edition of the Questiones super libro De Animalibus Aristotelis, a work by one of the greatest philosophers and physicians of the 13th century, Peter of Spain (later Pope John XXI, 1205-1277). He took as the basis for his work the translation from the Arabic made in Toledo around 1220 by Michael Scotus which included three important Aristotelian treatises. Preceding the critical edition, Dr Navarro offers an introduction to the person and works of Peter of Spain, the intellectual context of the 13th century characterized by Scholasticism and an Aristotelian Renaissance, and a short analysis of the linguistics and form of the Questiones. She also analyses the sources on which Peter drew, Greco-Latin, Arabo-Jewish and, of course, late antique and medieval treatises, showing that the text was not exclusively zoological in nature, but discusses important medical and philosophical topics, illustrating his extensive knowledge of both the Aristotelian corpus and 13th-century medicine. The text (divided into XIX books) is not a mere commentary about animals, but rather, as the title shows, a collection of questions in the Salernitan manner, the use of which was considered most appropriate for analysis and communication in the medieval scientific community to which Peter of Spain belonged. Alongside methodological and zoological problems, Peter of Spain discusses important questions disputed among the scholars of the period, including the location, hierarchy, motion, function and parts of the principal organs, the five senses, and many other medical issues such as reproduction, illnesses, or growth. Finally Dr Navarro includes a glossary that contains proper names (mainly those of the authorities and sources quoted by Petrus Hispanus), animal names (and their parts and substances), and the names of plants, metals, and the like. Contents: Foreword, José Martínez Gázquez and Cándida Ferrero Hernández; Preface. Part I Introduction: author and work: Peter of Spain (1205-1277); The 13th century context; The work of Peter of Spain; The content of the Questiones super libro ‘De animalibus’ Aristotelis; The sources of the Questiones super libro ‘De animalibus’ Aristotelis; Peter of Spain’s zoology: versions and manuscripts; Language and form; The edition. Part II Edition of the Questiones super libro ‘De animalibus’ Aristotelis: Signs and abbreviations employed in the Apparatus Criticus; The Questiones super libro ‘De animalibus’ Aristotelis. Manuscripts consulted and bibliography; Index.